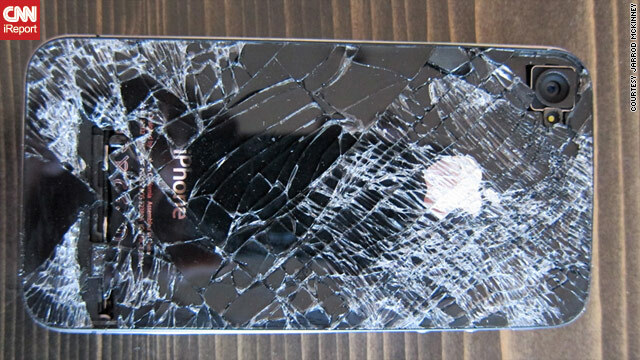 This iPhone fell out of Jarrod McKinney's pocket while he was skydiving. It still makes calls, he says. (CNN) -- Jarrod McKinney's iPhone 4 -- a notoriously fragile device -- cracked when his 2-year-old knocked it off a bathroom shelf. "I was like, 'Man! That's all it takes to crack the glass?' " he said. So it's easy to see why McKinney, a 37-year-old in Minnesota, would be "just absolutely shocked" when that same phone survived a fall from his pocket -- while he was skydiving from 13,500 feet. Just to be funny, Johnson decided to call the busted phone. He didn't expect the call to go through. But it did. McKinney felt the phone vibrate and started laughing. "They were all like, 'It works! It works!'" he said of his friends watching his rooftop search from the bottom of the building. That's especially amazing since the iPhone 4 can suffer from cell reception issues. When the Apple smartphone debuted in 2010, a saga the tech media called Antennagate followed. Consumer watchdogs claimed a design flaw on the phone's antenna caused it to drop calls unexpectedly. Apple gave out free phone cases to address the issue. Mike Gikas, a tech editor at Consumer Reports, the nonprofit group that tests phones and other gadgets for their reliability, jokingly said that McKinney finally found a way to fix the phone's reception woes, by dropping it from a plane. "That's the proved method for fixing the antenna problem," he said, laughing. Gikas said it is possible a phone could survive a major fall. "I think that can happen," he said. "I think water is harder to deal with than shock." McKinney, who first submitted this story on CNN iReport, the user-generated news site, said he's not sure when the phone slipped out of his pocket during his fall from the plane. He was in a rush to "get out the door" (of the plane), he said, and forgot to zip the pocket of his baggy skydiving pants, which are designed to be loose-fitting so they catch air and slow him down as he falls from the sky. The iPhone had protective gear of its own -- an Incipio-brand phone case that was broken after the fall but still was on the phone. Even though the phone still makes and receives calls, it isn't very practical to do so because the touchscreen is shattered. IPhone users must use the gadget's screen to dial numbers and to answer incoming calls. The only way McKinney can use it is with a Bluetooth connection in his truck. He plans to get the screen fixed, though. "It goes to show you if I crash land and need an ambulance, they can still track me down with the GPS," he said. Some Android phones -- Apple's main competitors in the smartphone field -- are perhaps better known for their durability. As CNN's Mark Milian reports, Google, which makes the Android mobile operating system, launched several of its phones into space, tied to balloons. Also, in case you were wondering if it's weird for a skydiver to take his phone on a jump in the first place, apparently it's not. There is a host of online videos of skydives filmed on smartphones. McKinney said he always takes the phone with him so he can call someone if he gets lost after he hits the ground. Sometimes the wind blows skydivers away from the intended destination, he said. He noticed his phone was missing after he was on the ground. He reached into his pocket, wanting to take a video of his wife, who had jumped after him. "I was actually really bumming because I've lost a phone in the past and I usually just have a ton of photos and videos of my kids on the phone," he said. "I just knew it was gone. Falling from that height? (What are) the chances of you finding something like that or even knowing where to look?" CNN iReport's Carly Costello contributed to this report.